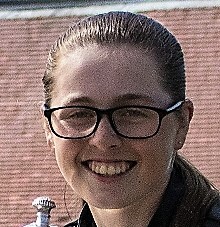 Scottish girls champion last year, Hannah Darling (Broomieknowe) demonstrated her class again by winning the Scottish Girls' Open by six strokes over 54 holes at the Eden Course, St Andrews today. Hannah, pictured, had scores of 67, 71 and 71 for a four-under-par aggregate of 209 at the head of a strong, international field. Runner-up was English-born, Australia-based Isabelle Simpson with rounds of 71, 70 and 74 for 215. Aboyne's Carmen Griffiths finished a creditable joint 15th on 222, alongside Katy Alexander (Blairgowrie).